There's lots to love about growing lemons. Woe is me, I say to my friends--I have so many homegrown lemons that I simply don't know what to do with them all. One can eat only so much delicious lemon meringue pie and lemon chicken and fresh lemonade. My friends are starting to avoid me. Well, what Northwest gardener wouldn't boast a bit, harvesting citrus at home? To be honest, the lemons were a lagniappe--a most welcome bonus--to the cultivation of a plant I was growing for its attractive form and heaven-scented blossoms. Winter after winter, my container-grown Improved Meyer lemon has transported me from my modest greenhouse to Tuscany with a single whiff. All bragging aside, citrus are surprisingly willing container plants in the Pacific Northwest. In fact, they're so accommodating that over the years my sons and I started several mandarin and grapefruit trees from seed. Though these after-dinner experiments never blossomed, they lived for many years as happy and handsome (though spiny!) houseplants. Buoyed by my success, I made the pilgrimage to Raintree Nursery in Morton, WA, where I purchased a gallon-sized, dwarf Meyer lemon. Now twelve years old and five feet high, this is the same prolific plant that keeps my family scurvy-free throughout the darkest days of the year. Though I've picked up a few tricks to keep it happy, for the most part it has proved both reliable and resilient. The Improved Meyer lemon (a virus-free version of the original Meyer lemon) is most likely a cross between a lemon and an orange. The fruit is juicy and slightly sweeter than a true lemon, though with plenty of delicious lemony acidity. It holds for more than a month on the tree. 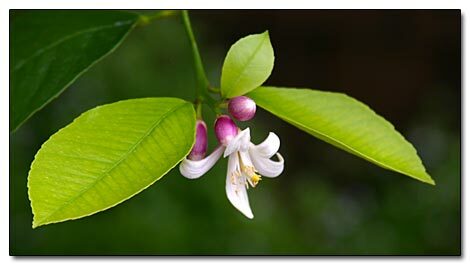 The plant is less sensitive to cold than other lemons, reportedly surviving brief temperature dips to 18°F (7°C), though flowers and fruit will be sacrificed long before the temperature reaches freezing. Many citrus varieties, including the Meyer lemon, are self-fertile. According to Katy Fraser, horticulturist at Raintree Nursery, these traits make the Meyer lemon a top choice for indoor/outdoor growing here in the Northwest. This citrus and other good candidates found in the Raintree catalog are all grown on dwarfing rootstock, which helps keep them happy in containers. I recommend that citrus be grown in pots in the Northwest. "I recommend that citrus be grown in pots in the Northwest, as it's hard to get the excellent drainage and consistent warmth citrus craves otherwise," says Fraser. "The Meyer Improved is the easiest to grow and actually get ripe fruit on. The Buddha's Hand citron is my nomination for the most interesting fruit--people don't believe it's real!" In a maritime climate, potted citrus is best kept outside in the summer, indoors in the winter. Though a cool greenhouse (to 55° F (12°C) at night) is ideal, the plants do quite well as houseplants, with proper care. In September or October, as indoor and outdoor temperatures reach equilibrium, gradually acclimate the plant to its indoor home. Reverse the process when moving it back outside in April or May. Placing an over-wintered citrus in the dappled shade of a deciduous tree is a good way to reintroduce it to full sun. "Remember to ease the transition," Fraser advises. "Yellow leaves and defoliation are reminders that abrupt change is rough on us all. 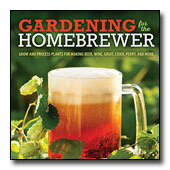 Keep indoor citrus out of drafts and in the most sun possible for best results." 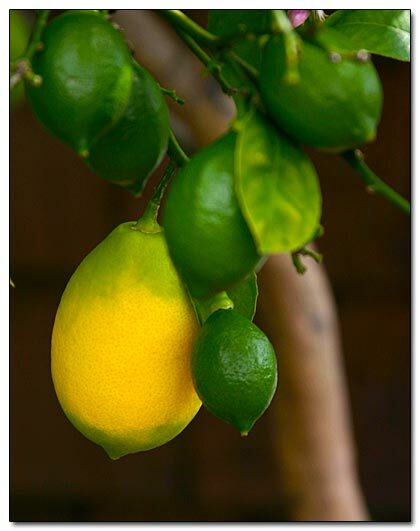 Citrus needs excellent drainage in both pot and potting soil. If both are free-draining, and the plant's roots fill the container, it's hard to overwater them. Although plants should never stand in water, too little moisture can cause flower and fruit drop. Containerized citrus benefit from root pruning and repotting every couple of years. Never underestimate the appetite of potted citrus. Never underestimate the appetite of potted citrus. 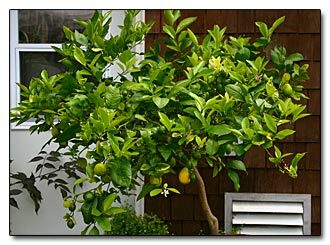 When the leaves of my lemon began looking nearly as yellow as the fruit, and the usual water-soluble fertilizers didn't help, I began using products heavy with micronutrients, and mulched with three inches of alfalfa meal. The lemon thrived. Now it's fed every two to three weeks from March to August with alternating applications of synthetic and fish fertilizer. It also receives a spring application of Osmocote and obscene amounts of processed alfalfa. "There are also fertilizers specifically formulated for citrus that work very well: heavy on the nitrogen and including trace minerals," adds Fraser. "Miracid works well for container citrus, and we also sell organic citrus food." Citrus is attractive to sucking insects, but non-toxic measures will head off most problems. For instance, horticultural oil spray is effective in ridding citrus of scale and mites; soap sprays can be used on aphids and mealybugs. "The main pest problems on Northwest citrus, scale and spider mites, are associated with bringing the plants back indoors after their summer vacation outdoors," Fraser explains. "Natural predators and conditions tend to hold them in check outside, but once inside, the pests proliferate. Luckily these problems are easily overcome with a Q-tip and alcohol for scale, and soap spray plus daily misting for spider mites." We in the Northwest have one advantage over growers in more conventional citrus country: lemons bloom almost continuously in our cool coastal climate (Take that, Florida!). And a basket of homegrown lemons is much more impressive in Tacoma than Tampa. Turns out, there's nothing sweeter than lemons. Just remember to share them with your friends. Then go ahead and brag. Photographs taken in author's garden by Debbie Teashon.